Musicians hire nationally touring artist Melanie Howe when they want more than accompaniment. Attitude and expression are important factors to be considered in the entertainment industry. Melanie’s experience in music performance, dance performance and artistic expression gives her an upper hand in promoting an exciting and memorable performance for the musicians she accompanies and for the audience in attendance. Her unique and innovative style of playing and performing has put her in demand with musicians and venues alike. Howe has played in music genres from R&B to country, from tropical rock to bluegrass, from pop to electronica and is trained classically. With over 10 years of live performance experience, Melanie Howe continues to draw curious crowds. Her fit, feminine flair draws the attention of all ages to her percussion playing night after night. She offers more than most in her energetic and exciting performance. With knowledge in music performance, both in professional percussion playing and competitive dance, as well as acting and modeling, Howe offers an unforgettable show every single time. Melanie built her first live performing band in 2004 and began touring nationally in 2011. She since has experienced a range of music business. Everything from being a hired gun, band leader, composer, and songwriter, she enjoys experiencing every angle. Melanie is able to fill the percussive needs for artists and entertainers across the nation. She brings a unique flair to the stage as a stylish and sensible woman who understands the basis of her wide repertoire of musical style. 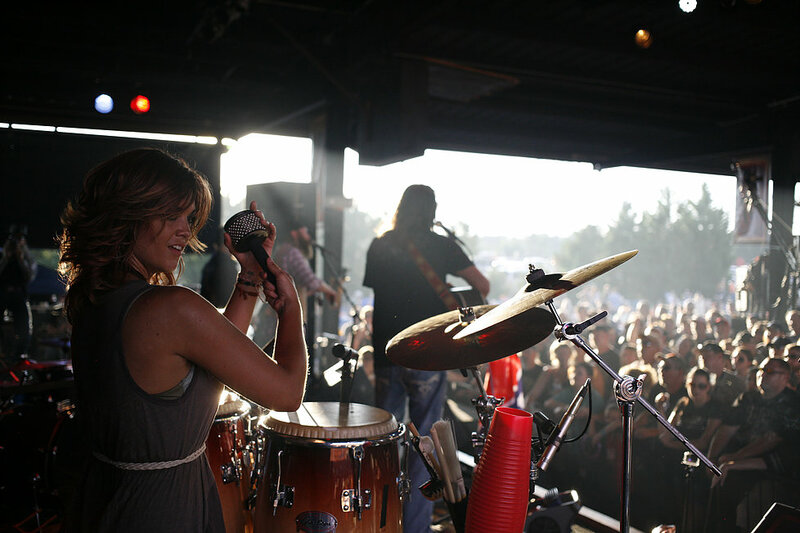 She is typically hired as a conguero, drum set player, hand drummer, multi-percussionist and back up singer. Howe is currently working as a freelance percussionist with several regionally touring acts and is the co-leader of “Drop Dead Dangerous”. ..In short, she looks the part, plays the part, acts the part and most importantly is the part.